For decades, coccidiosis control was accomplished through the use of effective in-feed anticoccidial drugs, writes Linnea Newman, DVM. But no single anticoccidial is sustainable when used without rotation. Used over decades, rotation/ shuttle programmes have begun to lose their efficacy, especially in smaller broilers with higher stocking density and more flock cycles per year in a single facility. Reduced efficacy has forced producers to rotate more frequently, and many producers have seen an increase in subclinical coccidiosis lesions between 24 and 42 days of age. 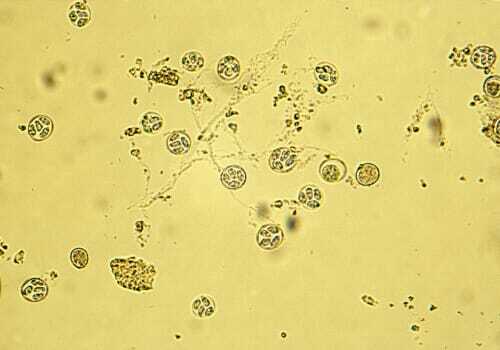 Vaccination with live coccidiosis vaccine that contains sporulated oocysts from each of the important Eimeria species provides an alternative to traditional anticoccidials. Vaccines are highly antigenic, but full development of immunity still requires each bird in the flock to be subjected to 3-4 life cycles of the parasite. The birds will shed oocysts from hatchery vaccination beginning at 4-6 days of age into the poultry house. If the environment is conducive to Eimeria sporulation, the oocysts become infective and complete the remaining life cycles in the house, providing a field boost, free-of-charge and without administration labour. The time from vaccination until complete immunity is 21 to 28 days, depending upon the vaccine and house conditions. Uniform administration is critical because birds that are missed by the hatchery vaccination will enter the poultry house in a naïve condition. They are subject to wild Eimeria oocysts that remain in all poultry houses despite thorough cleaning and disinfection. They are also subject to the oocysts shed by their properly vaccinated hatch-mates. Uniformity of oocyst recycling in the poultry house is also critical for the next three to four weeks. The young broilers must have access to sporulated oocysts to complete each successive life cycle. ‘Sporulation’ is a process that must happen to make the oocysts infective. Heat, moisture (25 per cent litter moisture or 60 per cent relative humidity) and oxygen are needed for the sporulation process to occur. Field recycling may be disrupted by dry litter conditions and low flock density. Reduced sensitivity of poultry Eimeria to anticoccidials results in the appearance of subclinical lesions between 24 and 42 days of age, together with shedding of wild-type oocysts into the litter immediately before slaughter. The late build-up of oocysts in the litter can cause carry-over of oocysts to the next flock, despite cleanout and disinfection. Initial vaccinated flocks must contend with early exposure to wild strain, before complete immunity is developed. But these flocks will not, themselves, have a late build-up of oocysts. Thus the carryover challenge becomes less and less through sequential flocks. Vaccine is not subject to resistance. Proper vaccination is a sustainable programme that avoids late subclinical coccidiosis and provides protection flock after flock. Therefore, it is important to monitor house conditions to ensure proper sporulation and recycling is continuing to occur. This is particularly true for antibiotic-free flocks that are placed with lower stocking density and lower litter moisture. Monitor flocks using sequential faecal oocyst counts or lesion scoring sessions to ensure the self-boosting programme continues as seasons and house conditions change. Coccidiosis vaccination is an effective and sustainable coccidiosis control method that can result in performance that exceeds an anticoccidial programme.